We are pleased to share recent company and energy industry highlights with you! The safety of our employees and our community is at the heart of everything we do at our Company. It’s our number one priority and is a great part of our culture. "As part of our summer readiness, we share heat-related safety information with our crews because they are working outside in the sweltering heat. 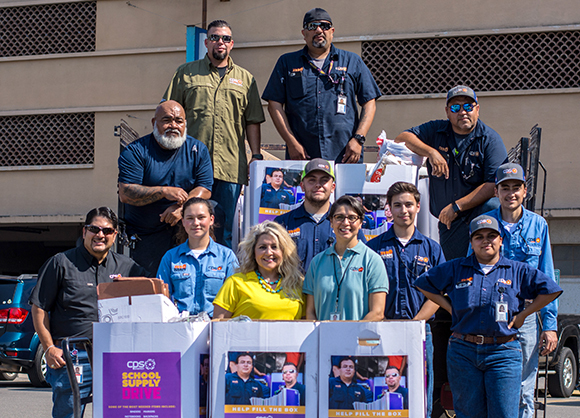 We emphasize the importance of staying hydrated and how to prevent and recognize heat-related illnesses such as heat exhaustion and heat stroke," said Rudy Garza, Senior Vice President of Distribution Services & Operations. Thanks to that training, a pair of our employees, Distribution Trainee James Avila and Journeyman Serviceman Faustino Sanchez, knew how to respond when they were driving on the east side of town and noticed one of our community members, who seemed disoriented. Our team members recognized the person was experiencing a heat-related illness, called 911 and pulled them to a shaded area and out of harm's way. The employees stayed with the individual until EMS arrived. "I'm extremely proud of how James and Faustino utilized their training and showed compassion in this emergency situation that unfolded right in front of them,” added Rudy. “Their response and quick actions possibly saved this person's life." James and Faustino were interviewed by local TV station KENS-5. You can click here to see photos of that interview. 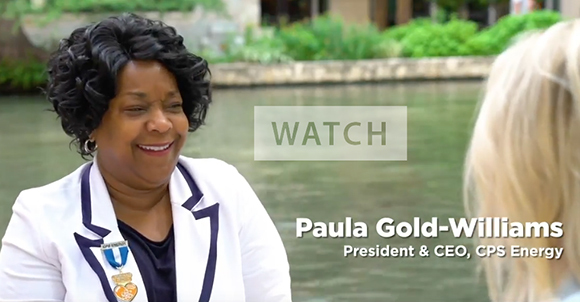 President & CEO Paula Gold-Williams will be featured in “thePoint,” a Facebook-based public affairs show produced by KGBTexas Communications. 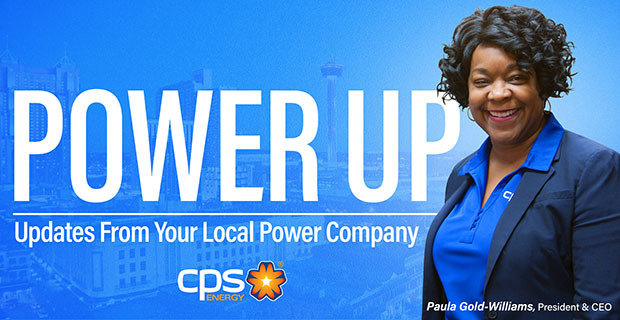 Earlier in August, Paula caught up with Katie Harvey, CEO of KGBTexas, to talk about CPS Energy’s Flexible Path, air quality and what we can all do to improve it, as well as Paula’s priorities for the coming months and years. “thePoint” is where our community receives perspectives through quick interviews with San Antonio leaders and influencers. The monthly show gives leaders like Paula an opportunity to talk about important issues in San Antonio. The show will be posted on KGBTexas Communications’ Facebook page. 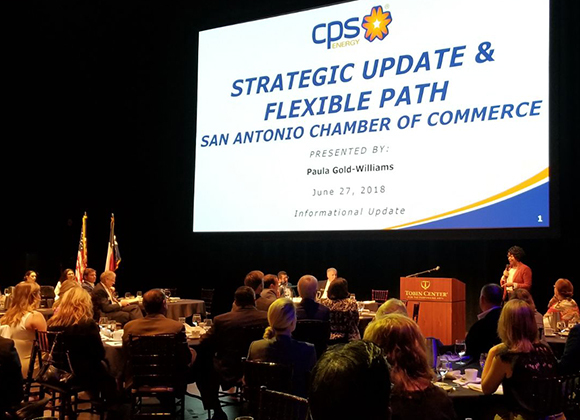 Our President & CEO, Paula Gold-Williams, presented our Flexible Path to fellow San Antonio Chamber of Commerce Board Members at their June 27 meeting. Participants took this opportunity to ask questions and provide suggestions regarding our Flexible Path. Paula also gave updates on our strategy to affordably use more clean energy in the community, and introduce new technologies such as energy storage in batteries (or other chemistries) to meet the energy needs of San Antonio. Leaders from several of our business areas participated in a special training on July 2 to demonstrate our readiness in handling emergencies affecting the Electric Reliability Council of Texas (ERCOT), the operator of our statewide power grid. Annual training such as this makes sure we’re able to meet our goals of providing reliable service to our customers, protecting the power grid, and offering timely and effective communications to our community should any type of emergency affecting our power grid arise. We are accepting applications through Sept. 14 at 5 p.m. to fill the seat of Trustee Dr. Homer Guevara Jr., who is completing his second five-year term on our Board of Trustees and currently serves as the Board's Vice Chair. Dr. Guevara represents the Southwest Quadrant of our service territory and his term ends January 31, 2019. Our Board of Trustees serve as our primary governing body and work with the CEO and management team to oversee business operations of the nation's largest municipally owned electric and gas utility. Additionally, they are responsible for setting policies and reviewing the strategic plan as recommended by senior management. Applicants must be U.S. citizens, permanent residents of Bexar County, and live within our Southwest Quadrant 4 service territory that encompasses San Antonio City Council Districts 4, 5, and 6, as well as portions of 1, 3, and 7. A tool on our website allows you to enter your address to find out which CPS Energy Quadrant you live in. We encourage you to spread the word about this opportunity to serve our community. Visit cpsenergy.com/trustees for more information and to view the application and eligibility requirements for the Southwest Quadrant vacancy. 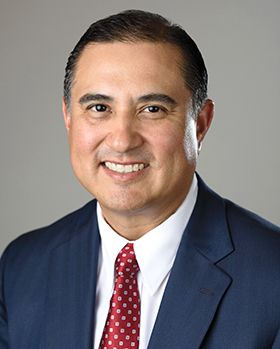 • Dr. Homer Guevara Jr. is an economics and government professor at Northwest Vista College and a CPS Energy Board member who is in his 10th year of representing our community’s Southwest Quadrant. Twenty-eight journeymen from across our company began their Foreman Leadership Development program on July 11. Journeymen are skilled workers who have successfully completed their official apprenticeship qualification in their craft. They must complete 6,000 hours of hands-on training in the field and in the classroom to become proficient in their field. 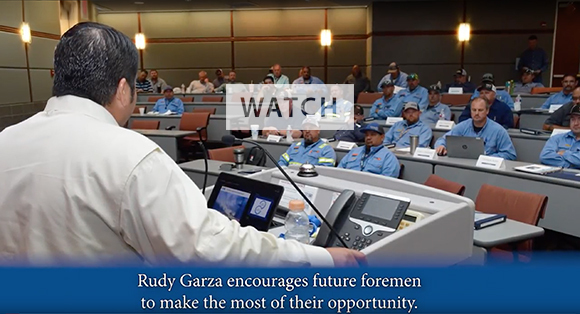 Rudy Garza, Senior Vice President of Distribution Services & Operations, delivered the keynote message to the group, sharing his personal journey as a leader. Rudy encouraged them to be their best and set great examples for others to follow. The journeymen will complete 60 hours of instruction by next May, giving them the tools they need to be effective leaders and enhance the level of customer service we’re committed to providing. Twenty employees completed the inaugural year-long program this past May. 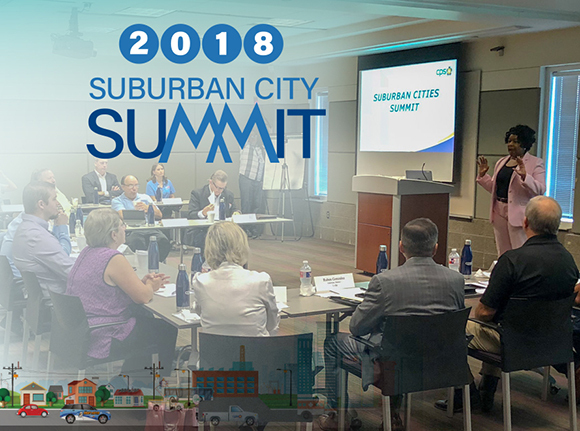 Our President & CEO, Paula Gold-Williams, and other members of our leadership team, spoke to officials from the 31 suburban cities we serve at our Suburban Cities Summit on July 13. Mayors, city managers, and other leaders received updates about our Flexible Path, our environmental programs - including a briefing on the development of the Climate Action and Adaptation Plan, an Electric Reliability Council of Texas (ERCOT) summer update, and information on some of the newest technologies being used at the company. Representatives from Schertz, Alamo Heights, Lytle, Castle Hills, Live Oak, Balcones Heights, Shavano Park, Castroville, Olmos Park, Converse, Leon Valley, China Grove, and Universal City attended the summit. Our company’s Energy Market Policy group hosts monthly informational meetings where leaders can receive updates and discuss policy changes and trends related to the Electric Reliability Council of Texas (ERCOT) and the Public Utility Commission (PUC) of Texas. The PUC provides statewide regulation of the rates and services of electric and telecommunications utilities. Beth Garza, Vice President of Potomac Economics & Director of ERCOT-Independent Market Monitor (IMM), was a guest at the July 17 meeting. An IMM is used to evaluate the performance of the markets and oversee the conduct of its market participants. 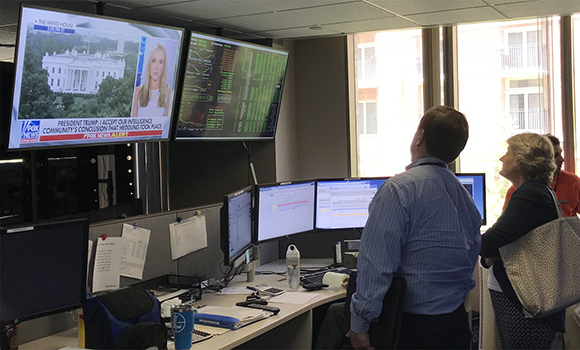 After receiving an overview of our company’s Flexible Path, she and the group of leaders engaged in a thoughtful discussion on the effects of this change to our planning and the larger ERCOT grid. Throughout the year, the Texas Public Power Association (TPPA) hosts conferences and meetings for members to provide them with the latest news and notes from around the industry. TPPA represents the interests of public power providers in our great state of Texas. Additionally, TPPA provides resources through which members, like CPS Energy, may educate others on public policy matters affecting the public power industry. TPPA’s annual conference in July focused specifically on customer service, communications, and matters related to large commercial customers. 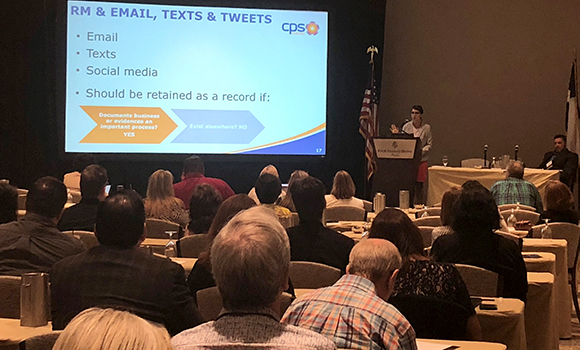 At this event, Deputy General Counsel & Chief Records Management Officer (CRMO) Zandra Pulis gave a great presentation, titled "Email, Texts & Tweets: Information Management Issues for Public Utilities." 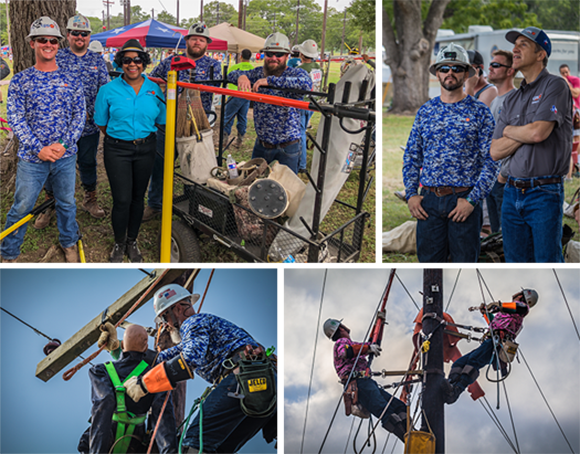 Our Rodeo team, comprised of three journeyman teams and 10 apprentices, performed exceptionally well at the July 21 Texas Lineman’s Rodeo in Seguin. Our skilled team went up against the best of the best from dozens of utilities across the state. The Rodeo team, consisting of apprentice and journeymen linemen, participate in competitive events in safety, skill and knowledge in the field. Apprentice Lineman Robert Webb finished third in the mystery event. The mystery event isn't announced to competitors until it actually begins (the mystery event turned out to be a lightning arrestor change-out). Both Clarence and Robert qualified to compete in the 2018 International Lineman Rodeo in Kansas City and the 2018 American Public Power Association (APPA) Lineman Rodeo in Colorado Springs. 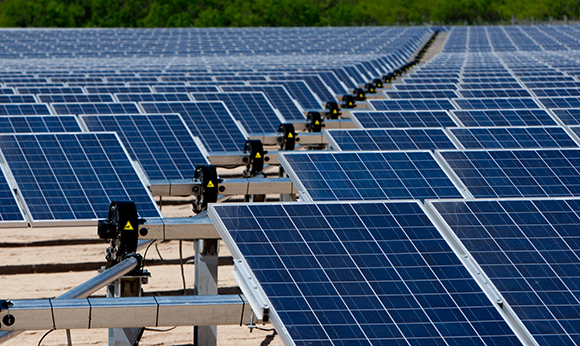 In July, the Bexar County Appraisal District determined that individually owned solar panels located within community solar farms are exempt from property taxes. Earlier this year offsite solar panels were deemed taxable. At that time, owners of community solar panels were told they would have to pay property taxes because the Bexar County Appraisal District considered community solar panels income-producing property. This new determination is a result of our company’s efforts, as well as our engagement with customers, letters of support from San Antonio District 9 Councilman John Courage and Bexar County Precinct 3 Commissioner Kevin Wolff, and a meeting with the appraisal district facilitated by District 1 Councilman Roberto Treviño. Roofless solar programs allow you to buy shares in a community solar farm and receive a credit on your bill for the energy your shares produce. 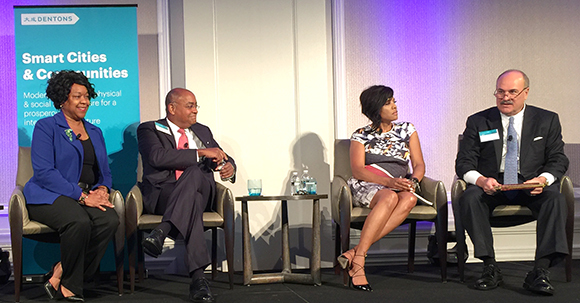 Our President & CEO, Paula Gold-Williams, participated in a thought-provoking panel discussion at the Dentons Smart Cities/Communities Summit in Washington D.C.
Dentons brought together leaders from across the country to discuss policy solutions for the future of American communities. “Our connection is to the community, the tie to water, energy, and transportation solutions, and to bring more people into the dialogue about the benefits of a digital community,” said Paula. The panel, which focused on key developments and challenges for Smart Cities and Communities, was moderated by Clint Vince, Chair, U.S. Energy Practice & Co-Chair, Global Energy Sector, Dentons. In addition to Paula, panel participants included: Stephanie Rawlings-Blake, former Mayor of Baltimore and former President of the Conference of Mayors; Rodney Ellis, County Commission, Houston; and Alexander Nuñez, Senior Vice President, Regulatory and External Affairs, Baltimore Gas and Electric Company (BGE). In February, Paula was named the Energy industry co-chair for the Dentons Smart Cities/Communities Think Tank. Future work for Smart Cities/Communities in San Antonio will be collaborative efforts with our City and local partners. 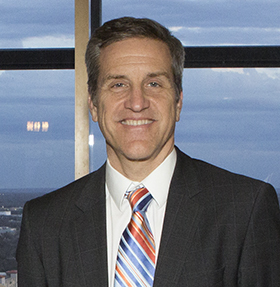 Our Chief Operating Officer (COO), Cris Eugster, is one of 15 top executives selected to receive San Antonio Business Journal’s (SABJ) prestigious C-Suite Award on Sept. 20. Honorees, announced at the end of July, are recognized for achievements in their jobs, industries, and community. ​Earlier this year, Cris was elected to serve as board chair for the Smart Electric Power Alliance (SEPA), which develops initiatives around clean energy, demand response, energy storage, and electric vehicles. He also serves as co-chair for the Puerto Rico Electric Power Authority's (PREPA’s) Transformation Advisory Council, which was created to boost renewables and make the island’s power grid more resilient following Hurricane Maria. Our Vice President of Community & Key Accounts Engagement, Maria Garcia, was among a select few to receive a Women’s Leadership Award from the San Antonio Business Journal. This prestigious award is presented to leaders who are making an impact in their organizations, careers and communities, and who inspire others to succeed. Maria’s contributions to our community and company include playing an integral role in the creation of our Casa Verde weatherization program which, to date, has helped about 21,000 families reduce their energy usage. She was a founder of our community engagement team, which provides customer care in neighborhoods and helps families who are in need of financial support. Earlier this year Maria’s team was recognized for their innovative approach to engaging customers and improving the customer experience with our Mobile Support Center. Maria and the other honorees were honored at a luncheon and featured in a special section of the Business Journal. 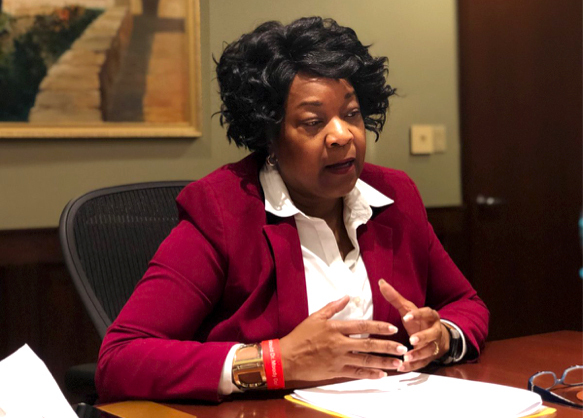 Our President & CEO, Paula Gold-Williams, was the guest speaker in a "Utility of the Future" webinar series hosted by Women of Renewable Industries and Sustainable Energy (WRISE). In an interview with Colleen Regan, head of U.S. Utilities and Market Reform at Bloomberg New Energy Finance, Paula spoke to the large web audience about our Flexible Path and shared how the future of energy will encompass electric vehicles, energy storage, and much more. 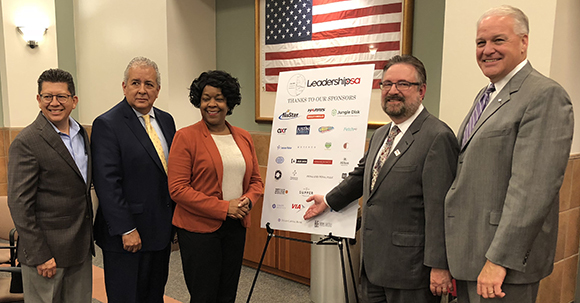 Our President & CEO, Paula Gold-Williams, spoke alongside San Antonio Water System President & CEO Robert Puente and other leaders at the Leadership San Antonio (LSA) panel on infrastructure. Paula shared insights about our Flexible Path, the future of the energy industry, and the future of leadership in the city. 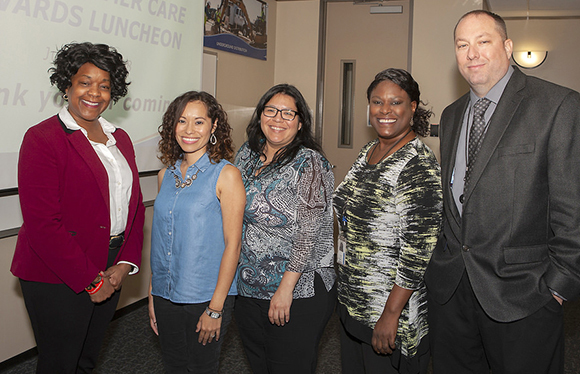 LSA is a jointly sponsored program of the San Antonio and San Antonio Hispanic chambers of commerce to help cultivate and train future community leaders. 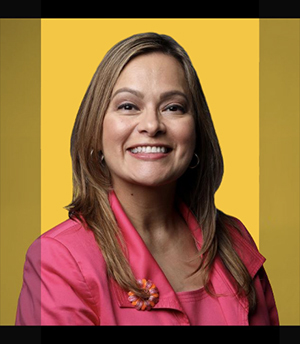 Paula is the 2018 Chair-elect of the San Antonio Chamber of Commerce. Our generous team members understand the value and importance of giving back to our community and always respond in a big way. This year’s school supply drive was no exception. It was inspiring to watch our team members bring in heartfelt donations of notebooks, pads, pens, crayons, binders, backpacks, and more. Collectively, our employees and summer interns donated more than two tons of school supplies and $900 in cash for Stuff the Bus, ensuring local students start off the new school year with everything they need. Click here to read our Newsroom Blog covering this wonderful gesture. 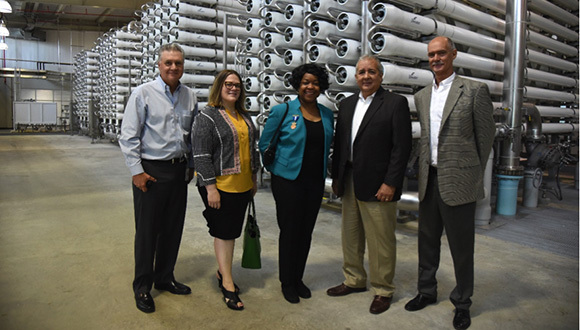 Our President & CEO, Paula Gold-Williams, toured the San Antonio Water System (SAWS) H2Oaks desalination facility and met with SAWS leadership to discuss potential future partnership opportunities. 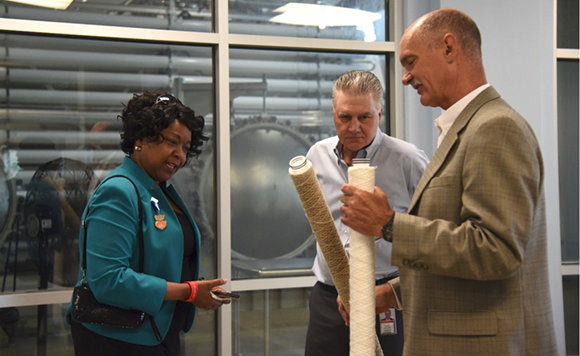 Accompanied by Senior Director of Business & Economic Development David Jungman, Paula received a behind-the-scenes look from SAWS CEO Robert Puente and Senior Vice President & Chief Operating Officer Steven Clouse at how SAWS pumps salty water from nearly 1,500 feet underground and treats it to produce 12 million gallons of drinking water each day. President & CEO, Paula Gold-Williams, joined other leaders from around the country on the Electrification: A Big Idea panel, which kicked off the Electrification 2018 Conference & Exposition. The event was hosted by the Electric Power Research Institute (EPRI) in Long Beach, California. EPRI is a global organization that collaborates with the electric industry and stakeholders in research, development, and projects for the benefit of the public in the United States and around the world. “This is one of the most exciting times in our industry,” Paula told those gathered for the conference. “Everybody needs to be thinking about change in our industry. Customers are changing and we need to adapt to what they want from their energy provider.” She took the opportunity to talk about San Antonio and our Flexible Path that is going to enable us to affordably find new solutions and new ways to serve our customers and community. Joining Paula on the panel and in the discussion were: Terry Bassham, President & CEO for Evergy Inc.; Gil C. Quiniones, President & CEO for New York Power Authority (NYPA); and Kit Kennedy, Senior Director of the Climate and Clean Energy Program for the Natural Resources Defense Council (NRDC). Steve Mitnick, Editor-in-Chief for Public Utilities Fortnightly, served as moderator. Electrification 2018 brings together industry experts and thought leaders to share their insight on electrification and emerging technologies. 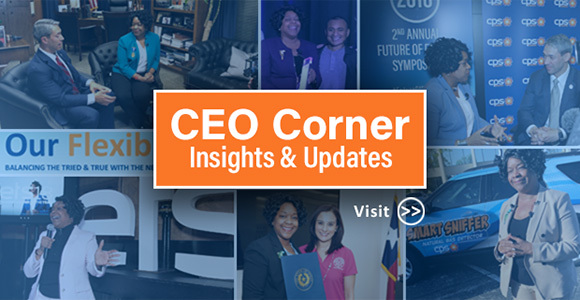 • Terry Bassham, President & CEO, Evergy Inc.
See our latest blogs and news releases highlighting our services and accomplishments in the NEWSROOM.